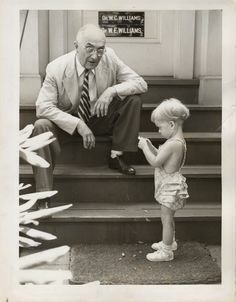 "Call for Babies" - In Search of Babies Delivered by Dr. William Carlos Williams ~ The History Girl! The Meadowlands Museum, in conjunction with St. Mary’s General Hospital, is issuing a call for people who were delivered by Dr. William Carlos Williams, famed doctor and noble laureate poet. The Meadowland Museum is launching an exhibition called "The Practice and the Patent: Healthcare in the Early 20th Century." The exhibit will focus on the innovations in healthcare history, from around 1900 to 1950, by the exploring the products and breakthroughs of Becton Dickinson, a company formerly located in Rutherford. It will also delve into the other side of medicine, the person-to-person interaction with doctors. 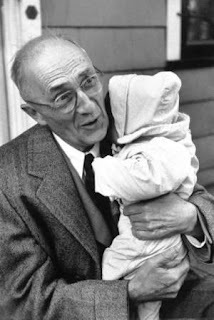 One such practitioner, William Carlos Williams, a Rutherford resident, is today known for his poetry but actually worked as physician for over 40 years in the region. His specialty was obstetrics and pediatrics, and he delivered many babies, in the town of Rutherford, as well as during his time at Passaic General Hospital (now St. Mary’s General Hospital). If you were born between 1912 and 1951 and were delivered by Dr. William Carlos Williams, please contact Jesse Gordon, jgordon.mmus@gmail.com or call 201-935-1175, if you or someone you know would be interested in participating in a special event in late July 2015, celebrating Dr. Williams and the Meadowlands Museum exhibition. Please respond before July 5, 2015. This exhibition explores innovations in healthcare from 1900 to 1950. This is the era when doctors made house calls, and the general public had less access to information about health issues than they do today. The museum also is privileged to have equipment used in the doctor’s practice of Rutherford’s poet laureate and most famous physician, William Carlos Williams, and from his son William Eric Williams, loaned to the museum by The Estate of William Carlos Williams and William Eric Williams, by Daphne Williams Fox. St. Mary’s General Hospital, of Passaic, NJ, is another partner in the exhibit, as William Carlos Williams was a member of the medical staff from 1924-1963. The exhibit will include medical equipment, on loan from the Becton Dickinson Archive Collection, a company formerly located in East Rutherford, New Jersey. The company produced medical equipment such as fever thermometers, syringes and needles, and has continued to manufacture products into the 21st century. Objects on view will show how the technology has transformed, from non-disposable glass syringes to innovative new products, increasingly specialized for different uses. Also on view will be some historic items from local pharmacies of the Meadowlands region. Come and take a step back in time and enjoy this new exhibit with history buffs and other visitors at The Meadowlands Museum, open on Wednesdays and Saturdays from 10:00 am - 4:00 pm. This exhibition will remain on display until September 5, 2015. Each year, The Meadowlands Museum welcomes children and adults, helping them to appreciate the historical and cultural sense of place that is the Meadowlands region. Founded in 1961 to connect school children with their community, the museum continues the work that began with that single inspiration. The Meadowlands Museum is located at 91 Crane Avenue, Rutherford, NJ 07070, near the intersection of routes 3 and 17. For more information, visit www.meadowlandsmuseum.com.